62445301681 ../;jsessionid=1017918udsejt6gby158e5ftx9otbf.10179?wicket:interface=:0:beta-club:modal-container:modal-content:content:body:login-rixty-form:visibilityContainer:fbconnect::IActivePageBehaviorListener:1:1&wicket:ignoreIfNotActive=true It seems like your browser is preventing Facebook Authentication. This happens when your browser's Tracking Protection is enabled. To continue logging in via Facebook, please turn off Tracking Protection or use a different browser. 62445301681 ../;jsessionid=1017918udsejt6gby158e5ftx9otbf.10179?wicket:interface=:0:login-panel-small:login-small:login:modal-container:modal-content:content:body:login-rixty-form:visibilityContainer:fbconnect::IActivePageBehaviorListener:1:1&wicket:ignoreIfNotActive=true It seems like your browser is preventing Facebook Authentication. This happens when your browser's Tracking Protection is enabled. To continue logging in via Facebook, please turn off Tracking Protection or use a different browser. 62445301681 ../;jsessionid=1017918udsejt6gby158e5ftx9otbf.10179?wicket:interface=:0:login-panel-small:login-small:signup:modal-container:modal-content:content:signup-form:fbconnect::IActivePageBehaviorListener:1:1&wicket:ignoreIfNotActive=true It seems like your browser is preventing Facebook Authentication. This happens when your browser's Tracking Protection is enabled. To continue logging in via Facebook, please turn off Tracking Protection or use a different browser. 62445301681 ../;jsessionid=1017918udsejt6gby158e5ftx9otbf.10179?wicket:interface=:0:redeemcode:modal-container:modal-content:content:body:login-rixty-form:visibilityContainer:fbconnect::IActivePageBehaviorListener:1:1&wicket:ignoreIfNotActive=true It seems like your browser is preventing Facebook Authentication. This happens when your browser's Tracking Protection is enabled. To continue logging in via Facebook, please turn off Tracking Protection or use a different browser. The MOLPoints Rixty Game Card Promotion (the "Promotion") is sponsored by Rixty, Inc. (the "Sponsor"), located at 133 Kearny St, Suite 202, San Francisco, CA 94108. The participant game publishers are not a sponsor or administrator of this offer and assumes no responsibility for this offer. This Promotion is open to anyone 13 years or older who (a) is not excluded by the criteria below, (b) who has provided a valid email address and validated that email address, and (c) who accepts the rules of participation. Employees of Rixty, Inc., its affiliates, distributors, resellers, advertising and promotion agencies, contractors, printers and suppliers of promotional materials, and the immediate family members and household members (whether or not related) of each are not eligible. Void where prohibited by law. This Promotion is governed under the laws of the State of California, USA. Except where prohibited, in the event that any dispute arises regarding the meaning or interpretation of these Terms and Conditions and/or this Promotion, participants agree that the dispute shall be resolved by applying the laws of the State of California and that it shall be resolved by binding arbitration via an arbitrator located in San Francisco County, California, USA. a) Login to your existing Rixty account or sign up for a free Rixty account at www.rixty.com. If you are signing up for a free Rixty account, you will need to provide a valid email address and verify that email address. b)	Add value to your Rixty account by entering the PIN on back of the Game Card. 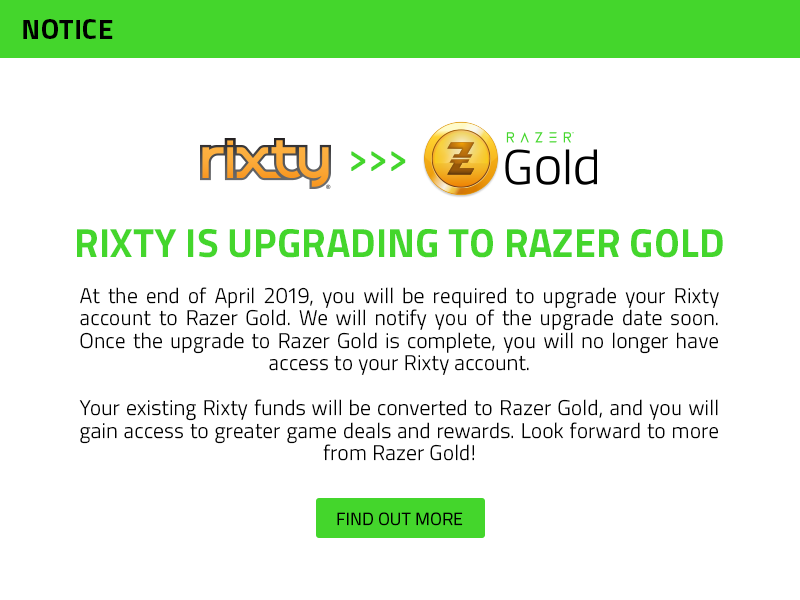 c)	During the same calendar month in Pacific Time as when the Card was redeemed, spend using Rixty at any game or website that accepts Rixty or MOLPoints for payment. See the Promotion webpage for information about available Bonuses and the valid month of availability. Bonuses vary by calendar month Pacific Time. All Bonuses are awarded "as is" with no warranty or guarantee, either express or implied by Sponsor, and are non-transferable. All Bonus details are at Sponsor’s sole discretion. For each Bonus, Rixty has the right, in its sole discretion, to substitute the stated in-game value instead of the advertised Bonus. All Bonuses are subject to availability and Sponsor reserves the right to offer alternative Bonuses of equal or greater value. Recipients, or their parent or legal guardian if recipient is an eligible minor, are solely responsible for all applicable federal, state and local taxes with respect to the applicable Bonus. Recipient(s) will be notified at the email address of their Rixty account. If a recipient does not redeem the Bonus before its stated expiration date, if any; or does not meet these Terms and Conditions or eligibility requirements; or he/she (or their parent or legal guardian if such potential Bonus recipient is an eligible minor) forfeits the applicable Bonus; then Bonus will be forfeited. e) Any condition caused by events beyond the control of Sponsor and their respective agents and contractors, which may cause the Promotion to be disrupted or corrupted. BY PARTICIPATING IN THE PROMOTION, YOU AGREE TO RELEASE AND HOLD SPONSOR, ITS EMPLOYEES, AND ITS AFFILIATES, SUBSIDIARIES, DIVISIONS, AGENTS, CONTRACTORS AND RESELLERS, AND THE EMPLOYEES, SHAREHOLDERS, OFFICERS AND DIRECTORS OF EACH HARMLESS FROM ANY AND ALL LOSSES, DAMAGES, RIGHTS, CLAIMS, AND ACTIONS OF ANY KIND IN CONNECTION WITH THE PROMOTION OR RESULTING FROM ACCEPTANCE, POSSESSION, OR USE OF ANY BONUS, INCLUDING, WITHOUT LIMITATION, PERSONAL INJURIES, PROPERTY DAMAGE, INVASION OF PRIVACY, AND MERCHANDISE DELIVERY. The Promotion may be terminated by Sponsor at any time without prior notice; provided however, that Bonus(es) earned prior to termination will be delivered to recipient(s). By entering this Promotion, participants agree to be bound by these Terms and Conditions. Sponsor retains the right to interpret Terms and Conditions, and the decision of Sponsor is final and binding in all matters relating to this Promotion.